Model T Ford Forum: Crank starting with right hand? Crank starting with right hand? 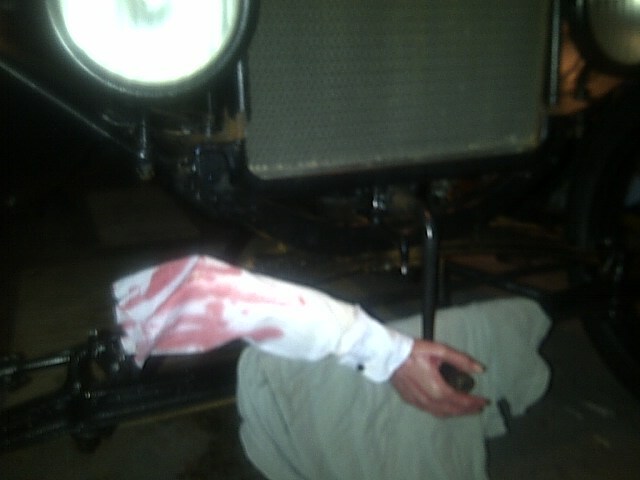 Model T Ford Forum: Forum 2011: Crank starting with right hand? I thought you guys told me to crank it with my right hand! It's obvious that your thumb wasn't tucked in the proper position. You grabbed it facing the wrong way. The problem was (from the position of your hand) you had to be standing IN the engine compartment. Did it hurt much ? Well the James Baker I knew was Sheriff of Wright County, Missouri, but that was in the late 40's. With the thumb in the postion it would have been ripped of, in case of a back fire. This sows the whole arm gone. Sad, but it can happen, but there is a side note he cn get a fake right arm, but not as good sa the original. I hope Ralph Ricks doesn't see this thread. He's off delivering the original '12 touring body up north. Yes, crank it with the right hand, but not that crank! Is he going to be OK? That feller Hugh Jass with the roofing tar can fix him right up. At least he held on. Where did the body land? I suppose that if the arm were not attached to the body, it wouldn't matter whether the thumb were around the crank, or which detatched arm you used. Just hold this arm with the remaining good hand so it won't happen again.